Lois Marie DeMeuse, 83, of Sturgeon Bay, was called Home to be with the Lord and was reunited with her husband, Robert, Friday afternoon, April 12, 2019 at Anna’s Healthcare CBRF in Sturgeon Bay. She was born April 16, 1935 in Sturgeon Bay, the daughter of Francis Fredrick Schallie and Mary Alice (Walker) Schallie. Lois graduated from Sevastopol High School. Lois was united in marriage to Robert Nels DeMeuse on May 1, 1954 at St. Joseph Catholic Church in Sturgeon Bay. They were blessed with over 42 years of marriage. Robert preceded her in death on July 6, 1996. For over 40 years, Lois helped Robert operated the family farm located on County Road EE in the Town of Gibraltar in addition to caring for her family. 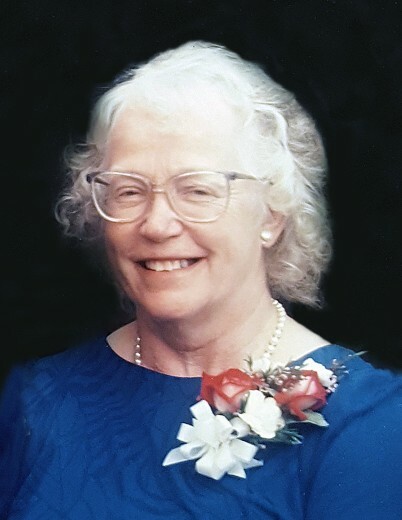 Lois was a former member of St. Mary of the Lake Parish in Baileys Harbor (now Stella Maris Parish-Baileys Harbor site) and served as secretary for National Farmers Organization (NFO). She enjoyed gardening, crafts, and dancing. Lois had an appreciation for genealogy. Above all, Lois loved spending time with her family and friends. Her love will live on in the hearts of her 11 children, Tracy (Steve) Propsom of Sturgeon Bay, Susan (Wayne) Paul of Sturgeon Bay, Vicki (Kurt) Kluge of Forestville, Kathy (Carlos) Marquez of Fish Creek, Christine Surfus of Sturgeon Bay, Bob (Ann) DeMeuse of , John (Diane) DeMeuse of Maplewood, Bill (Monica) DeMeuse of Omro, David (fiancé, Cheryl Heikkila) DeMeuse of Brussels, Richard (Nicole) DeMeuse of Fish Creek, and Rebecca (Matt) Looker of Fremont; 36 grandchildren; 31 great-grandchildren; sister, Arliss (Ken) Kettner of Green Bay; siblings-in-law, Marie Felhofer of Germantown, Ed (Diane) DeMeuse of Sturgeon Bay, Ken Delsart of Green Bay, and Marianne DeMeuse of Texas; other relatives; and friends. A Mass of Christian Burial will be celebrated at 11:00 a.m. on Tuesday, April 16, 2019 at St. Joseph Catholic Church in Sturgeon Bay with Fr. Robert Stegmann as celebrant. She will be laid to rest in St. Joseph Cemetery beside her husband, Robert. Visitation for family and friends will be held at Huehns Funeral Home in Sturgeon Bay on Monday, April 15, 2019 from 4:00 p.m. until 7:00 p.m. with a parish wake service to conclude the evening at 7:00 p.m. Visitation will continue at the church, Tuesday morning, from 9:30 a.m. until 10:45 a.m. Expressions of sympathy, memories, and photos of Lois may be shared with her family through her tribute page at www.huehnsfuneralhome.com.